Have you wondered why some pictures show jaggies on the edges when they are resized larger. Or why some pictures don’t show jaggies when enlarged? Those jaggies have more to do with the type of graphics you’re resizing, and broadly speaking, there are two types of computer graphics: bitmaps and vector graphics. If you use graphics often, understanding these two formats, their differences, and how they are created is essential. To put in a nutshell, bitmap graphics get the jaggies when they are resized. And vector graphics can be resized to any extent without the pixelated jaggies. Learn about the differences between Bitmaps and Vector Graphics. Gil Segal is the creator of ToolsToo and a senior software consultant. Gil is always on the lookout for ways to automate manual tasks in any software he uses and has been a PowerPoint power-user since the mid 90’s. In this interview, Gil talks about the new ToolsToo v7.2 add-in for PowerPoint. This is a second in a series of guest articles by Bess Gallanis of Speaking with Power and Persuasion, an executive communications consulting firm based in Chicago. She is a communication coach, speaker, journalist, a student of yoga and insight meditation and the author of Yoga Chick (Warner Books, 2006). In this article, Bess finds an analogy between business storytelling and the new movie, The Social Network. Bess Gallanis looks at SOCO, that stands for single, overriding communications objective to make your stories stand apart. Mark really knows how to make the maximum impact with few words. More importantly, the profound wisdom and truth in his words cannot be doubted, although the messages he provides are peppered with controversial words and ideas. Some people may find this packaging helps them understand the message better. 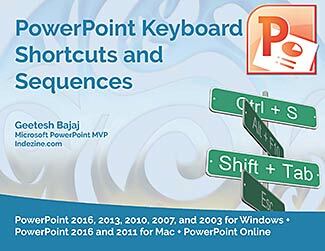 Among the many features in PowerPoint 2016, there are some that are more useful than the others. Options for using Guides are certainly vital. Many users are not aware of all the capabilities that Guides offer. For example, Guides can be added through the right-click menu. You can add new Guides that are offset to your existing Guides. Guides need not be grey in color, you can choose from 10 colors. PowerPoint provides several bullet styles that you can choose from, but they do look a little canned since almost every PowerPoint slide these days uses the same bullet styles! You could get rid of bullets altogether and use small sentences/paragraphs instead, or maybe you could explore picture bullets, to insert any picture as your bullet. Of course, for picture bullets to work, your picture needs to be small, no larger than a medium-sized dot. And it helps if it has transparent areas. If all this talk about the size and transparency of a picture bullet makes you curious, don't worry because we explain it all! Enabling Guides for your presentation slides helps ensure that your objects are easily aligned, and also in the same relative position in successive slides. But just enabling Guides is more like getting started. There’s so much more you can do, such as customizing the Guides themselves using hierarchical options. There are so many shapes available in PowerPoint, and that's good because that means so many more possibilities to create your own unique shapes by using any of the Merge Shapes commands. One of the amazing options within Merge Shapes is Combine, which retains areas where the shapes do not overlap while removing the overlapping areas. Think of Combine as an amazing cutout option! The Union command is part of Merge Shapes commands in PowerPoint that lets you unite two or more shapes with each other. The benefit of the Shape Union option is that you can quickly create complex shapes that may not have been easy to accomplish otherwise within PowerPoint. The Union command combines all overlapping and non-overlapping areas of shapes, subtracts nothing, and retains formatting of first selected shape.